Have stubborn weeds made the summertime intolerable for you? Do you find yourself spending a majority of your time doing back-breaking yard work? Does it seem like your weeds regrow as soon as they are pulled out? These all indicate a more serious weed control problem that requires the expertise of your local lawn maintenance professional. Mike’s Pest Control service is committed to providing expert solutions for your toughest lawn care challenges and providing unmatched satisfaction to all its customers. Mike’s Pest Control offers premium weed control services delivered by our highly-trained and experienced lawn maintenance technicians. Our weed control services program provides customers with high quality weed control treatments to ensure that your property remains healthy and looks inviting all season long. Whether we use standard non-selective fertilizer or custom weed control formulas to eliminate your pesky weeds, you can be sure that the highest level of expertise and care is being put toward the healing and restoration of your lawn, yard, or structure. Our experts will throroughly sift through yo ur property in search of problematic growth that may contaminate the health of your lawn and yard, and following the proper diagnosis, our weed control specialists will secure the best solution to help bring your greenery back to its original vibrancy. At Mike’s Pest Control, we understand that your weed control issues may differ depending on soil type, local climate, and growing conditions. Our team of expert lawn care technicians will analyze your soil and make suggestions and provide solutions tailored to meet your exact needs and the requirements of your soil. 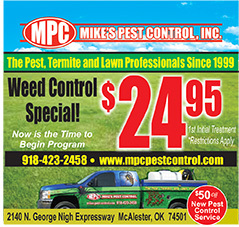 Mike’s pest control is dedicated to providing high quality services and professional solutions to all its clients. We offer a satisfaction guarantee.